Health insurance for foreigners in the Czech Republic will allow you to use the variety of medical services from different health facilities and it will protect you in case of an injury, illness or other health problems. 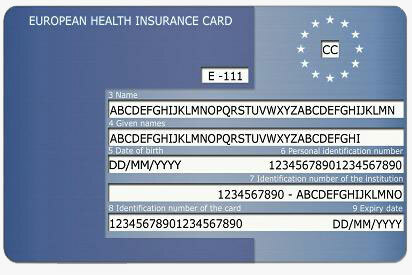 Due to the law about the stay of foreigners, every foreigner who is not a holder of the European health insurance card EHIC and is not a citizen of the state which has a bilateral agreement with the Czech Republic, is obliged to present a proof of Travel Health Insurance for Foreigners. The insurance contract has to include also coverage in case of injury which was caused intentionally or as a result of narcotic/psychotropic substances or consumption of alcohol. What are the types of travel health insurance for foreigners ? Foreigner’s health insurance is divided into two main types: Acute and emergency health care insurance (at PVZP insurance company it is called Basic health insurance for foreigners) and Comprehensive health insurance for foreigners. Comprehensive health insurance for foreigners or Acute and emergency care, what should I choose? Choosing the right health insurance is not difficult, but it depends on different factors. Firstly, it is important to consider your type and period of stay in the Czech Republic. Also, it depends on your preferred coverage and situation. For example Comprehensive health insurance for foreigners is appropriate for families with children, since it covers also the necessary vaccination and preventive checkups at the doctor. On the other hand Acute and Emergency health care is recommended for foreigners who want to stay only for a short period of time in the Czech Republic and want to be covered in case of some acute health problems or accidents. This insurance is meant for foreigners, who apply for a short term visa and want to stay in the Czech Republic for no longer than 90 days. It covers the expenses for medical treatment connected to acute health complications or an accident. In other words it covers injuries, acute health problems, acute complications where postponement of the medical treatment could cause threat to one’s life. This health insurance also includes repatriation of the patient or in case of his death repatriation of the remains to the home country. Acute and Emergency health insurance does not cover preventive health care or medical treatment connected to non-acute health problems. It is meant for foreigners, who apply for a long term visa and are willing to stay more than 90 days in the Czech Republic. 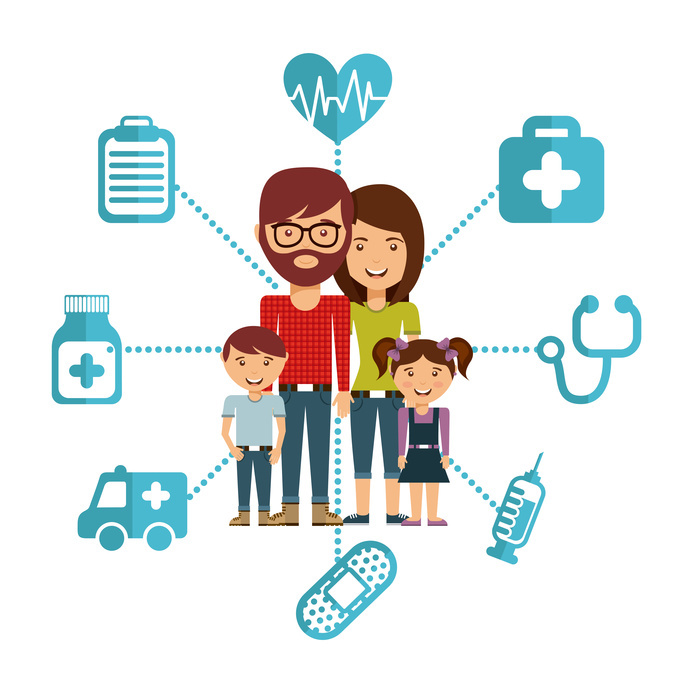 This insurance type covers expenses of not only Acute and Emergency health care but also preventive and dispensary care and medical treatment connected to pregnancy and birth giving, dental care, prescribed medication and expenses of medical devices. Does health insurance for foreigners cover pregnancy? 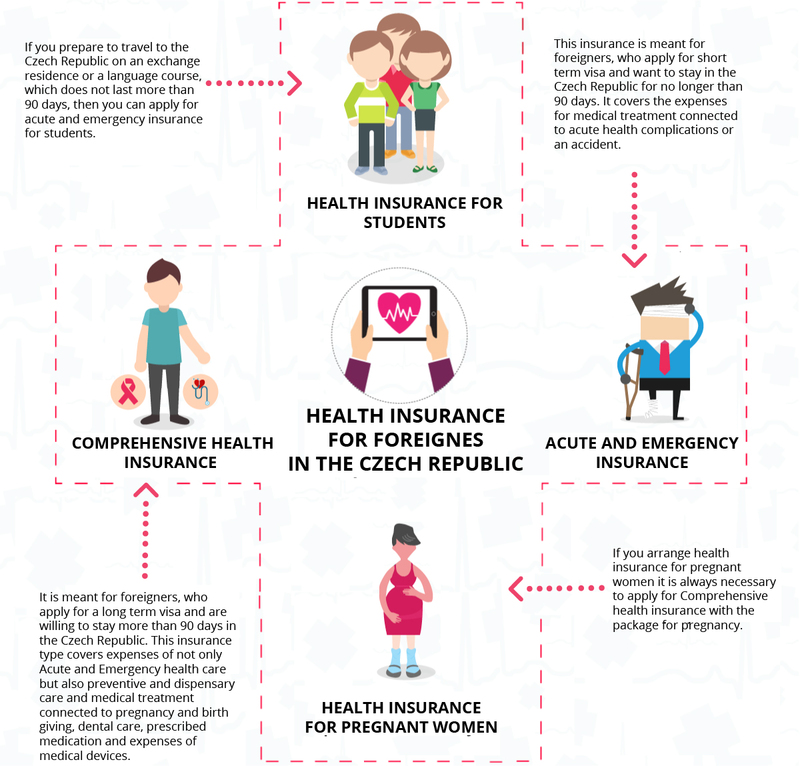 Yes, comprehensive health insurance for foreigners in the Czech Republic also covers treatment of pregnant women. For this purpose we recommend you to apply for the pregnancy type of comprehensive health insurance. This special “pregnancy package” is usually arranged for the minimal insurance period of 12 months and it covers not only pregnancy and birth giving, but also the post natal care of the baby (until its release from the maternity hospital). To arrange this insurance type it is necessary to undergo a medical examination and fill in the application for the insurance. 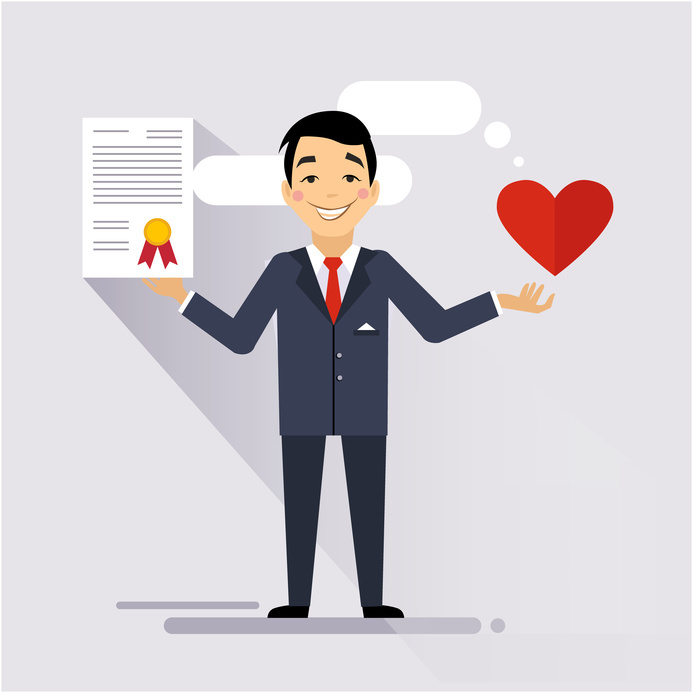 Afterwards, all the documentation will be presented to the insurance company doctor who decides whether this client is risky for the insurance company and whether he will be accepted to the insurance or not. What insurance companies in the Czech Republic offer health insurance for foreigners? Health insurance for foreigners is not offered by every insurance company in the Czech Republic. Health insurance companies have to initially undergo a process of approval by the Central National Bank of the Czech Republic, and be registered on its list of authorized insurance companies which may offer health insurance for foreigners. Among those insurance companies are: PVZP insurance company, Maxima insurance company, Slavia insurance company, Uniqa insurance company or Ergo insurance company (the whole list can be found on the official website of ČNB). Insurance companies comparison- which insurance company provides the best health insurance for foreigners? Deciding which insurance company is the best is very difficult. Every insurance company offers different advantages for different prices and is also focused on different people. For example Slavia insurance company has favourable prices for students, PVZP insurance company has the biggest list of contracted facilities, and ERGO does not require a medical examination for the pregnancy package insurance. It really depends on for what purposes you need health insurance for foreigners and what you expect from such insurance. Thanks to our calculator of health insurance for foreigners you have the possibility to easily check and compare all offers of the insurance companies mentioned above and pick the most advantageous health insurance for you. For the chosen health insurance you can directly apply through our website and arrange it in 5 minutes. How does the application through our website work? Application through our website is very quick and easy since you only need to fill in the requested details and then pick the option which fits you the best. After filling in the insurance contract you can purchase the insurance from the comfort of your home through a payment card or bank transfer. After receiving the payment from you, you will be sent all the necessary documents to your email. It is also possible to receive these documents via post to the chosen address. If you have problems with application for the insurance or just simply don’t know which health insurance type to choose, you can contact us on this telephone number: 777 795 466. There are our operators available for you and will gladly help you with the arrangement of the insurance or even make the application for you. Because we cooperate with the biggest commercial insurance companies on the market, we can afford to offer you various discounts which you wouldn’t be able to get anywhere else. So when comparing prices on your health insurance through our website, you can be sure that the given price is the cheapest one. The price of the insurance depends on so called “price determining factors”, which are insurance period, insurance type, type of stay, age of the insured person and territorial validity of the chosen health insurance. Health insurance is for example often cheaper for students and adults up to 50 years old, since older age categories are more risky for the insurance company and therefore more expensive. Why apply for insurance on our website? Our online calculator and application system will not only spare you time and money, but also thanks to our qualified staff you can be sure that the arranged contract will be correct and valid, because we check it every time before sending the originals to your email.